Since Britt and I have been in Madrid, all Britt has told me (aside from her wanting to go see some guy charm a snake in Morocco) is that she wants to see a beach. I thought about where to go. Maybe Cádiz? Or Alicante? Or Benidorm? Maybe even a trip to the Canary Islands? But in the end, I figured the best place for us to go would be Valencia because they have the beach but also the Oceanográfic, which is something I’ve always wanted to see. And it’s a lot cheaper to get to. I have been to Valencia before but it was only for Las Fallas last year, so I didn’t get to see much of the city since, let’s face it, I went there to party with all of my friends. I talked to Jeana and her friend Alex beforehand to see if they wanted to come along since they were going to be coming to Madrid around the time that Britt and I wanted to go see Valencia. We all coordinated the trip together. On Thursday morning, we woke up at the crack of dawn and caught the bus out of town to Valencia. The ride was pretty quick: only 4-hours by bus. The best part was the arrival. We weren’t sure what to expect of the weather, although Britt thought ahead and all she wanted to do was wear a dress on the beach. And sure enough, the second we stepped off of the bus, the weather was absolutely wonderful! We started stripping off layers it was so hot. While we waited for the bus to take us to our hostel, we were taking off coats, hoodies, rolling up pants and stripping off our socks, it was that hot. I couldn’t believe that at this time of the year it could be so warm. Britt and I had become so used to the freezing cold in Paris and Madrid that it was almost unfathomable to have enjoyable, sunny, warm weather this time of year. The weather definitely put all of us in a good mood. We checked into our hostel then wandered around the city a bit to try and go see the Oceanografic, which is Europe’s largest aquarium. The architecture itself is worth seeing: It looks like some futuristic space ship and landing pad. It’s hard to describe, because it’s such an abstract edifice. Upon arriving, we realized we’d only have about 2 hours to enjoy the place and the entree fee was about 25 euros so we decided we’d put it off for the day. We ended up grabbing some gelatto to take a break and cool off. From there, we grabbed another bus and headed to the beach. Everyone I talked to (except Agathe, who recommended we go to Valencia) said that the beaches in Valencia were really ugly. I kept this in mind, especially after Britt and I visited my friend Alejandra in El Escorial for an afternoon and she almost yelled at me for taking Britt to see an ugly city and ugly beaches. But everyone was wrong: The beaches were wonderful! We decided that everyone in Spain thinks Valencia’s beaches are ugly is because they are used to actually having beaches. But if you come from landlocked Denver, Colorado or even Madrid, any beach is enjoyable. And we didn’t find anything ugly about the beach or Valencia. We all fell in love! The beach was very nice. We stuck our feet in the frigid water, collected some seashells, and then once our feet were turning blue and the sky was fading to black, we caught a bus back towards our hostel. It seems that I cannot escape the parties in Valencia because the instant the bus dropped us off, we saw thousands of people crowding around the street of our hostel for a parade. That’s when I realized that it was January 5 and the following day was the Día de los Reyes Magos, or the Day of the Three Wise Men. January 6 is Spain’s official Christmas. It is becoming more and more popular to celebrate actual Christmas on December 25, but everyone gets their presents on January 6. So all the families were out with their kids to watch the parade. We had to push through hundreds of parade-goers to get to our hostel. Luckily, we had a terrific view of the parade from above, but it didn’t interest us too much since everything in the parade was religious related. But it was still really interesting to be able to see. From there, we headed towards the city center for dinner. We stopped by a place that seemed “typical Spanish,” but I’m sure it was designed for tourists. Alex and I shared a big bowl of Paella Valenciana, which after all, Valencia is where Paella originated. Jeana and Britt each got their own meals, and Britt ordered herself a delicious looking membrillo-jamón tapa. But we didn’t eat in the typical Spanish fashion by taking a few hours to eat, relax, and enjoy. We were a bit pressed for time. Earlier that afternoon, Carlo texted me with some exciting news: That night, Valencia was going to be playing against Sevilla! We all wanted to get tickets but weren’t sure how to go-abouts getting them. Plus, we figured it would be sold out since Sevilla and Valencia are two of the biggest teams in Spain. We asked around all day and the best results we got were: “Nah, it’s probably not sold out,” and “Just go to the stadium an hour before the game and you should be able to get tickets.” So that’s what we did. We finished our meal and caught the first bus to the stadium. There were people everywhere, and everyone was drinking on the streets. This is typical Spanish. Afterwards I learned that they don’t sell any alcohol in the stadiums (which would explain why I didn’t see anyone with beer in their hands like you’d see at any sporting event back in the States). I guess the football hooligans get a little too rowdy if they’ve got some drink in them. After fighting through the crowds, we made it to the Taquilla to buy our tickets. I asked for the four best 10-euro tickets (which were the cheapest) but unfortunately the guy said that all that were left were 30-euro or 40-euro tickets. Dang. That’s killing our budget. We left the line to think about what we were going to do. We figured we’d just go find a bar and watch the game, but NO! We came all this way, and it was now or never. Let’s go to the game! So we bought 40-euro tickets because that was the only way we could all be seated together. But who cares about the money! This was something they say you have to do. So after living in Spain (on and off) for about 2-years total, I finally made it to my first professional soccer match. Amunt Valencia! Then we went home to sleep. The next day we went to the Oceanografic, which was very large indeed, but nothing that spectacular. I guess it’s just any old aquarium, but this one is just really big. And again, I can’t put enough emphasis on its incredible architecture, you really have to see it for yourself. From there, we went back to the hostel to get our things, then headed to the bus station and rode home. Valencia is a place I could live in, honest. I absolutely loved it. I wish I could have stayed a little bit longer. We all wanted to stay: The weather was perfect, we never got to get day-drunk on the beach, and we really didn’t even get to explore the city center, which was much larger than we realized. Even the people were incredibly kind to us. I asked for directions, information, etc., and every person I spoke to was very patient and gave us great help. The strange thing to me is that in Valencia they speak Valenciano, which is a dialect of Catalan. But if you go to Catalonia and you ask for help in Spanish, they will respond to you either in Catalan or English regardless of who you are. They are very proud people of their language and despise Spanish (so I’m told.) But the Valenciano’s were all eager to speak to me and there was never an issue with them speaking Valenciano or Spanish. They all treated us the same and were incredibly helpful. I guess that just means that we’ll have to go back. I hope to see Valencia very, very soon. I’m glad you liked Valencia! I went last February for the first time and loved it too! Great weather, beautiful city, and the City of Arts and Science is awesome! We bought the pass that allowed entry to all the different museums and it was well worth it. Just seeing the cool architecture alone was great! Did you try horchata? I thought I wouldn’t like it but found that I loved it! Yeah that place is so cool! We just didn’t have enough time to see everything at the City of Arts and Science unfortunately, I’ll just have to go back! We didn’t have the horchata there but I’ve had it in other places and I love it! Horchata is sooo good. Thanks for commenting! 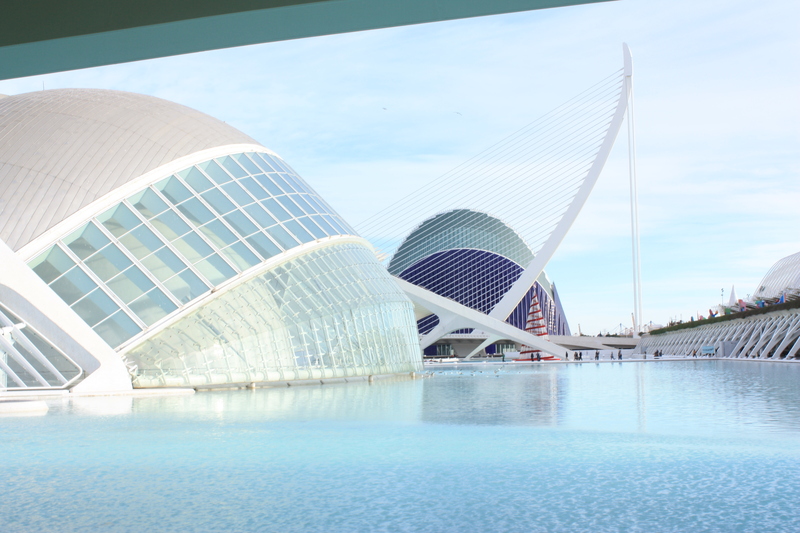 We’ve been in for just over a year now and haven’t made it to Valencia – you sell it well!